How can water resources management undertake systematic conservation planning for the future in light of the scientific uncertainty associated with climate change and other indirect human impacts on freshwater systems? One approach is to prioritize actions that would create win-win situations, such that humans and ecosystems would benefit from the outcome even if scientific predictions of future conditions prove inaccurate. Riparian corridor conservation is a clear example. Restoring and protecting native riparian vegetation along riverbanks and reconnecting floodplains to their channels will likely provide multiple benefits for both resource and biological conservation. This includes resource conservation to improve water quality, promote groundwater recharge, as well as provide flood damage mitigation; additionally, it includes biological conservation of aquatic, riparian and terrestrial species. Multiple federal and state statutes and regulations acknowledge the importance of riparian areas; however, the federal legal system has failed to be effective in protecting riparian corridors nationwide, despite other similar legislation proven effective (e.g. wetlands protection). Definitions and interpretations of riparian areas differ within and among federal and state agencies and other entities involved in determining riparian land use and management on public or private lands (including conservation easements). While some consensus exists at a “river reach-scale” (e.g. riparian buffers), we argue that many of the existing definitions used for riparian land management lack a “corridor-scale” view. 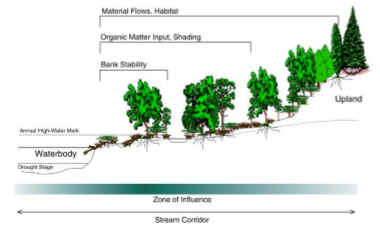 A corridor view is essential for (1) maximizing the benefits of continuous riparian function from headwaters to mouth of a river, and (2) strengthening the impetus to coordinate the decision making process for riparian lands across political boundaries. Recognizing the many obstacles to legislative change, our project aims to support collaborative, science-based decision-making within watersheds for water resource and biological conservation in complex social-ecological systems without new legislation. Specifically, the outcome of our proposed work is to support collaborative efforts to coordinate riparian corridor management within and across state or eco-regional boundaries. We will: (1) synthesize and codify riparian corridor definitions including legal and ecological considerations, (2) identify bridges and barriers to riparian corridor conservation across different Abstract 1 social-ecological systems, and (3) begin to design a science-based protocol to identify, prioritize and coordinate riparian conservation actions. We will use these funds to complete the first objective (doctoral dissertation chapter) and write two external proposals to complete the second and third objectives. To translate our research into action, we coordinate with the Bonneville Environmental Foundation, WSU Extension – Jefferson County, and Conservation Science Partners. At the outcome of this project, we will be at the center of preparing the legal and scientific foundation necessary for building a national scale riparian conservation network. « Scaling of hydrologic and land-surface responses: Are the right processes represented at the right scale?